The proposed contamination standard was finalized by China’s Ministry of Environmental Protection (MEP) on January 11, remaining unchanged at 0.5 percent. Last year, China notified the World Trade Organization (WTO) of its intent to forbid 24 kinds of solid wastes by the end of 2017 and to lower contamination thresholds. This action sparked an immediate reaction from three major waste and recycling associations—the Solid Waste Association of North America (SWANA), the Institute of Scrap Recycling Industries (ISRI) and the National Waste & Recycling Association (NWRA)—which submitted multiple filings and feedback regarding China’s intentions. The comments issued by the associations urged the Chinese government to add more specificity to the guidelines, issue a delay in implementation of any import regulations and reduce the proposed contamination standard of 0.5 percent. But despite these efforts, China’s waste import ban went into effect this month and the proposed contamination standard was finalized by China’s Ministry of Environmental Protection (MEP) on January 11, remaining unchanged at 0.5 percent. This decision was not one that the industry wanted, and ISRI, NWRA and SWANA have released statements on the finalized contamination standard, which will go into effect on March 1. SWANA went on to explain that many American and Canadian companies and local governments have made substantial changes to their operations in response to the restrictions and the sharp decrease in import licenses issued by Beijing in late 2017-early 2018. “Recyclables are going to landfills in Oregon, to waste-to-energy facilities in Massachusetts and being stored in warehouses and parking lots in the U.S. and Canada,” said Biderman in a statement. In addition, municipal governments in Lane County, Ore., Madison, Wis., and elsewhere are no longer accepting plastics they used to collect, and both Oregon’s and Washington’s environmental agencies are addressing emerging changes on their websites. 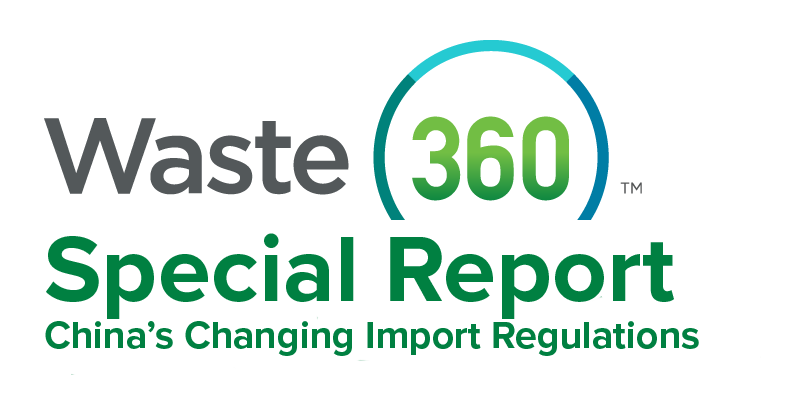 ISRI also expressed its disappointment in the finalized Environmental Protection Control Standards for Imports of Solid Wastes as Raw Materials (GB 16487.2-13). NWRA, meanwhile, believes that the short-term challenges that will come along with the new contamination standard will give way to new opportunities. Going forward into 2018 and beyond, the associations have stated that they will continue to follow this development and its impact on the industry. They have also expressed their commitment to working closely with governments, stakeholders and the public and private sectors on education efforts and contamination reduction efforts.